The new Children and Families Act is supposedly person (and family) centred, i.e. the child (and family) should be at the centre of all decisions made about them. The services and support should be what the child needs and not, perhaps, what his label says he should need. So many of us have spent time battling a system that has been based on diagnosis rather than individual need so this should hopefully be a big improvement- but this will most certainly take time so please don’t hold your breath. 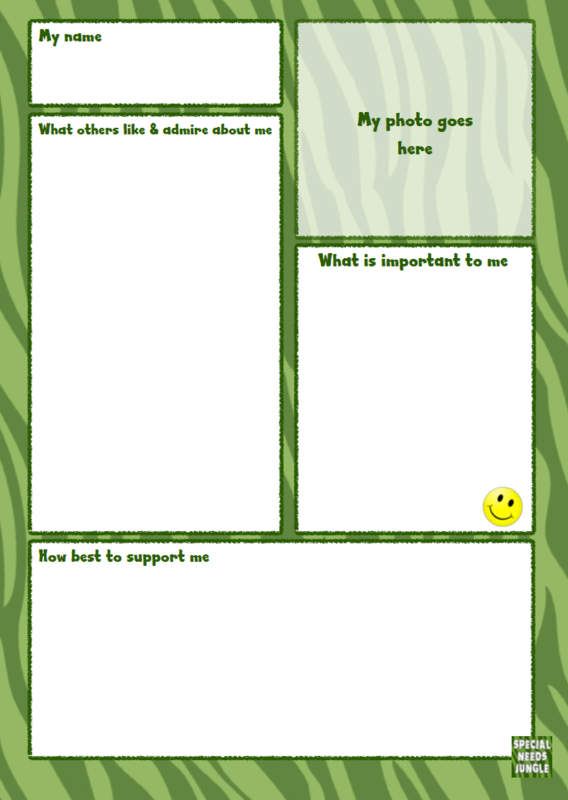 However, there are some ways you can start to introduce person centred thinking for your child and one of the easiest (and perhaps one of the most powerful) tools is a One Page Profile. A one page profile is a summary of what we like and admire about our children, what matters to them and how best to support them. They are a way for our children to have a voice in how they are supported and to have their strengths acknowledged and appreciated. This helps to raise their self esteem and confidence. They are also a great way as a parent to be able to share your “expertise” by explaining ways in which you support their child. The idea of a One Page Profile is that any person can pick it up and quickly have an overview of what matters to the child, how to support them and also their strengths and personality. Research has shown that people often start to skim read a paper after just one page, so providing some important insights into your child’s individual needs and personality on one page is a great way to keep people engaged. What goes into a One Page Profile? What do people like and admire about your child? Is it their smile, their sense of humour, their literal thinking, their memory, their hugs or something else? Is it that they persevere or perhaps they enjoy a challenge? For your child, it can be a really powerful self-esteem builder to hear lots of positives about themselves. So often, they will be sat with you in yet another meeting where everyone is talking about what they can’t do or what they need help with so hearing a list of things that people actually like about them is often a new experience. What is important to your child? Is it a particular toy or perhaps a need for everything to be kept in the same place? Is it being allowed some time to play Minecraft each evening or having certain brand of crisps? Is it going to the local park? Do they prefer a certain type of swing? This is not about what their needs are, e.g. something that keeps them healthy or safe; this is about what they like, what makes them happy? So often, we focus on their needs – especially from a practitioner’s perspective – and as a result, we forget about focusing on what makes them happy. How best to support me? This section looks at how we can support our children, this is where we share those tips that we know work. Maybe it is important to your child to have a certain toy/comfort blanket with them so if they arrived at a short breaks provider without it and you know that they will not focus without it, then to support them, the carer/provider could contact home so it can be dropped off. Maybe it is important to your child to have their socks a certain way, so people can support them by allowing them time to do this. Maybe it is important to your child to do certain things in a certain order, again, people can support them if they know this and the order it has to be done. Be as detailed as possible – if they have to have crisps, what brand, what flavour? Ask other people what they think works; maybe what works at home is different to what works at school. Use variations for different situations (e.g. one for school may be slightly different to one for the taxi driver). Remember, it is about what is important to your child, not to you. Most importantly, remember to involve your child with each step. Nothing about me without me, as the saying goes. Other uses of a One Page Profiles. Work One Page Profile: Produce a One Page Profile for yourself, what is important to you at work (or in the home), e.g. perhaps you work better if given a deadline rather than a generic “this needs doing”, perhaps you don’t like calls at home between 3pm and 7.30pm), etc. How can people support you? Do you like feedback if you send a general email or perhaps you need to be told specifically if someone wants feedback on an email they send to you? What works for you. Bringing Us Together are currently running a campaign, with support from Helen Sanderson Associates, to educate families on One Page Profiles, what they are for and how to produce them. The campaign is a mix of weekly posts and videos. If you are looking for more tips, resources and ideas, then their site has lots of useful information information. What is a One Page Profile and how does it differ to section 1 of an Education, Health and Care Plan? How do you complete the Appreciation section? How do you complete the Important To section?